Commercial construction is booming. Even in metro areas such as Houston where overall building starts are down, commercial construction is thriving. Companies need office space, labs, and auditoriums and commercial contractors are delivering. With this building boom also comes a glut of surface protection issues on jobsites. Commercial construction projects often run into different jobsite surface protection problems than residential projects do. For example, at the Knight Cancer Center in Portland, Oregon we were tasked with providing protection for specialty lab panels that were made bespoke for this building. Using a mix of our products including DoorGuard Plus and All-Protect we could create the surface protection solution needed. Particularly in hospital and lab settings builders have to construct complicated and custom features unique to that project. Large scale concrete floors, glass panels, and lots of doors are the most commonly protected surfaces on commercial projects. Builders have relied on our RamBoard, CoverGuard, and Tuf-Guard for protecting their concrete slabs. Corrugated plastic sheets have been used to protect walls and hallways in military barracks projects and even in university landscaping applications. We custom cut hundreds of corrugated sheets to protect curtain wall components for San Diego’s recently completed courthouse. With a wide variety of products, materials, and applications, just about any commercial finish and surface can be protected from damage. Just because a product for that specific purpose isn’t listed on a website or in a catalog doesn’t mean that there aren’t materials suited to protect it. If you have any surface protection needs let us know, as we’ve created packages for all manner of finishes, surfaces, and sizes. 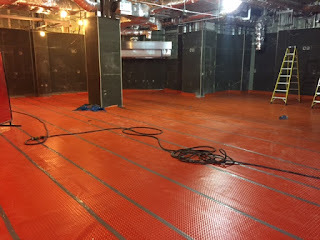 This entry was posted in Construction News, Uncategorized and tagged commercial construction, commercial surface protection, concrete protection floor protection by admin. Bookmark the permalink.